Connective tissues are the binding and supporting tissues that link and support other tissues or organs of the body. These tissues are distributed throughout the body and are most abundant. A. Areolar tissue; B. Adipose tissue; and C. Reticular tissue. 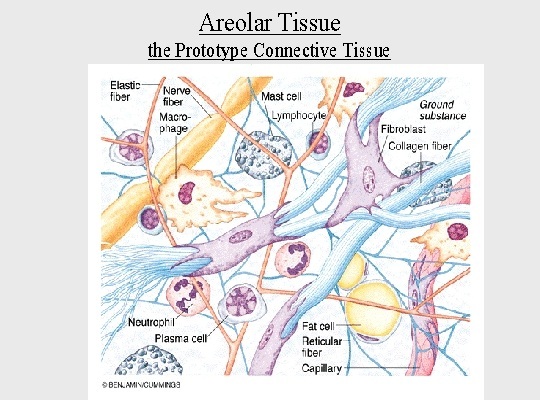 The areolar tissue is the simplest and the most widely distributed connective tissue found in the body of animals. It is transparent semifluid and gelatinous matrix which contains a mixture of mucin, hyaluronic acid and chondroitin sulphates. In the matrix are embedded various kinds of fibres and cells. Scattered throughout the matrix are numerous wavy bundles of collagen fibres and a loose anastomosing network of thin straight fibres of elastin. Collagen fibres are flexible but inelastic, while elastin fibres provide the tissue with considerable tensile strength and resilence. Very fine and thread-like reticular fibres are present, located around blood vessels and nerves, and form the connective tissue covering around muscle fibres. Cells, Interspersed in the matrix are a variety of different cell types. They include fibroblasts, macrophages, mast cells, plasma cells, chromatophores, fat cells, and mesenchyme cells. Fibroblasts are the cells which produce the fibres. They are flattened and spindle-shaped and contain an oval nucleus. They can migrate towards wounded tissue and secrete more fibres in this region to effectively seal off the injured area. 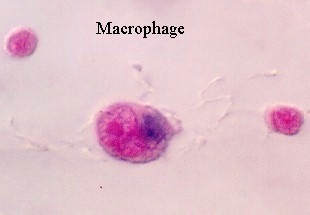 Macrophages (histiocytes) are polymorphic cells capable of amoeboid locomotion. They engulf bacteria or other foreign particles. Generally they are immobile, but at times cells wander to areas of bacterial invasion and, therefore, provide a means of defence for the body. 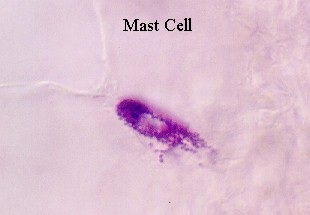 Mast cells are oval-shaped, small and contain granular cytoplasm. They secrete the matrix as well as heparin and histamine. Plasma cells are rare and are the products of mitotic cell division by migratory lymphocytes. When present they produce antibodies which are important components of body’s immune system. Chromatophores are present in specialised areas such as the skin and the eye. The cells are much branched and densely packed with melanin granules. Each fat cell contains a large lipid droplet which fills the bulk of the cell. The cytoplasm and nucleus of fat cell are confined to the margins. Mesenchyme cells act as reserve of undifferentiated cells for the tissue. They can be stimulated to transform into one of the above cell types as the need arises. 1. Areolar tissue is found around all the organs of the body, it connects the skin to the structures below, and binds sheets of epithelia to form mesenteries. 2. It also ensheaths blood vessels and nerves where they enter or leave organs. 3. It is also concerned in the nutrition of other tissues that lie embedded in its supporting frame-work. 4. Due to the presence of phagocytes or phagocytic cells, areolar tissue plays a defensive role in the digestion, destruction and absorption of noxious substances or organisms during infection. 5. It allows considerable stretching and recovery of tissues. The adipose tissue is simply a modification of areolar tissue in which fibrocytes have become active in the storage of fat. In mammals, adipose tissue is found in the subcutaneous tissue and dermis of the skin, the mesenteries and around the kidneys, heart, eye-balls and in the inguinal regions. In some animals like whales, a thick layer of adipose tissue occurs beneath the skin. The camel’s hump is largely composed of fat. The adipose tissue has no specific matrix of its own and is really areolar tissue. The adipose tissue contains a large number of spherical or oval fat cells or adipocytes arranged into lobules. Each fat cell is filled almost entirely by a central droplet which squeezes the cytoplasm and nucleus to the periphery. Because of the disposition of nucleus and cytoplasm at the periphery of each fat cell or adipocyte, a fat cell is said to present a characteristic “signet ring” appearance. 1. It forms reservoir of reserve food material to sustain the body during starvation, i.e., it provides a considerable energy reserve. 2. It acts as a shock absorber around the kidneys, heart and eye-balls. 3. It prevents heat loss by forming an insulating layer. 4. By virtue of its distribution through the animal body the adipose tissue is rather important in shaping the body contour. Reticular tissue consists of stellateshaped (star-shaped) reticular cells. 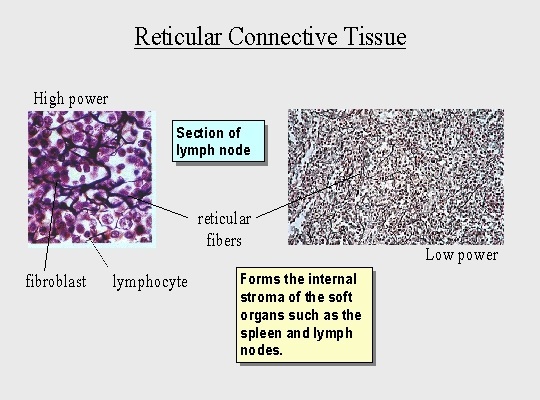 Reticular tissue is found in lymph nodes, bone marrow and the spleen. The protoplasmic processes of reticular cells anastomose to form an interlacing cellular network of reticular fibres. These reticular fibres appear to touch or cross each other and thus, what appears to be a network. The spaces that occur in the syncytium of stellate-shaped reticular cells are filled with liquid ground substance. The meshes of reticular tissue are filled with lymphocytes and these meshes of tissue are called lymphoid tissue. The reticular tissue which forms the stroma of the red bone marrow and the cells in the interstices of the tissue constitute myeloid tissue. 1. It forms the subepithelial tissue of gastrointestinal mucosa. 2. It forms the supporting framework in the lymph nodes, spleen and bone marrow. 3. The reticular cells are phagocytic and play an important role in the defence mechanism of the body. 4. The reticular cells probably also play some role in iron and fat metabolism. Dense connective tissue has more fibres in the matrix than cells. The fibres may be irregularly arranged or regularly arranged in such a manner that the individual fibres lie more or less parallel to each other. 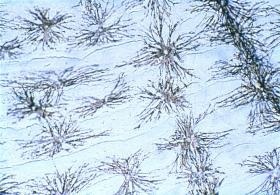 Fibers are so numerous the extracellular matrix contains few if any open spaces where ground substance is visible. The absence of open spaces between cells or fibers is subsequently a key identifying trait of dense connective tissues. Also, in dense connective tissues, there are fewer types of cells, the vast majority being fibroblasts or fibrocytes. 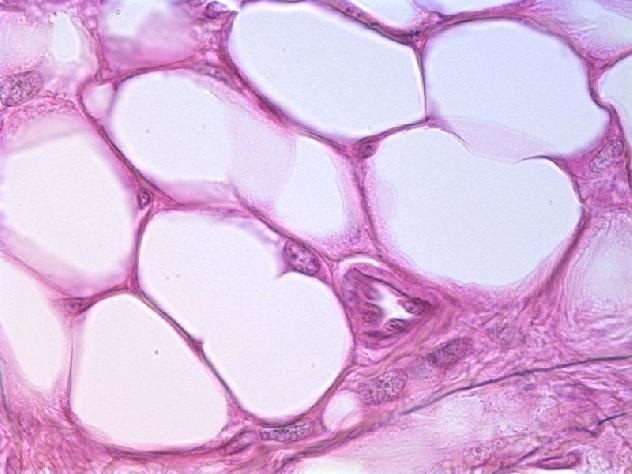 Dense connective tissues contain either collagen or elastic protein fibers. They show presence of bundles of parallel collagen fibers. They show bundles of non parallel collagen fibers. ​ex- Dermis of skin and joint capsules.